Little Green Men, Pork Roll Sammiches and oh yeah, this Personality Test Says I’m a D-bag… – #DoubleFML FatDarrellPalooza! Greetings Earthlings lol just kidding, we’ll get to alien talk at some point though but not today! Actually… ya know what? Okay fine, maybe just a little bit (lol that topic switch seriously wasn’t planned, my mind is literally that scary haha). So yeah, shows like Ancient Aliens are fun to watch and I was a huge X-files fan but in real life? I dunno man, my mindset is still a bit more Scully than Mulder at this point. Oh, my bad, for those of you who don’t speak “Nerdanese” that means that I’m still a bit skeptical lol. I mean come on, with all of these camera phones you’d think there would be more footage by now right? But still, some of these shows do make some interesting points so I really don’t know. Maybe? One day I’d love to get out to Area 51 or Roswell to check out the alleged crash sites. But in the meantime, lol check out this weird house I drove past in Bowman, South Carolina! So anyway, back here on Earth I just took this DISC personality quiz on Tony Robbins website and well, long story short, it says that I’m a jerk! I also took the Myers-Brigg Jung personality test (if any of you took either of these tests comment below!) which told me that I’m an ENTJ and as such, I’m an obnoxious jerk of the rarest caliber lol an upper-echelon d-bag if you will. A “Douches Bagiosas” I believe is the scientific classification lol an “Assholious Maximosas” lol. Oh yeah and I’m also a Scorpio (Halloween baby! October 31) so my sun profile also says that I’m a colossal obnoxious jerk… but this time with a vindictive spirit and deep rooted trust issues! And as many of you know, I was raised in New Jersey so when you ad that to the mix, apparently I’m completely hard-wired to be a prick lol. The only other place I lived away from the east coast was Phoenix and everyone there was pretty laid back from what I remember. And so are most of the people I’ve met from Colorado, California, Portland and Seattle…but that might be because they’re all high since weed is legal in those areas lol. Yoga – No fellas, this one isn’t just for the ladies. Aside from increased flexibility and focus, it also should also take your grumpy attitude down a few notches..lol namaste. Eat – See the above description for sleep. I literally carry snacks around all day. Those Snickers commercials are right. You wouldn’t like me when I’m hangry. Workout / Go for a walk – Gym therapy! Working out releases endorphins (natural feel goods in your brain kiddos) to help turn that frown upside down. If working out isn’t your thing, at least go for a walk…away from everyone else so you that you can give yourself some time to think…and others a break from you! Music – Getting lost in the music should also release some feel goods in your brain…ideally it would be something on the fun or mellow side though to help take your heart rate down a bit. Watch a movie/show – Temporarily escaping into a show might also help, just give yourself a time limit so that you don’t end up stressing even more because you wasted too much time. So binge-watching 8 seasons of Friends might not be the best idea…but a 30 minute break? Sure, have at it. Read – Same as the description of the movie/show idea…but analog instead of digital lol. Write – Writing out your feelings is always therapeutic. So if you’re pissed off, write out your nasty tirade instead of actually saying it – but don’t actually send it! Instead, reread it later when you’re less emotional or ideally, delete it and move on. By the time you’re done, the issue may not even be a big deal to you anymore. Turn off Electronics – Kill the screens and work on real world relationships more. Take a trip somewhere or catch up with an old friend. Read my blog and visit my social media pages first though lol but then yeah, give yourself a break from screens – especially if you stare at them all day as a part of your job. And definitely make sure to turn off those electronics and chargers while you’re trying to sleep. The constant alerts and glowing lights as your phone charges will make it hard for you to reach that 5th level of inception so you may wake up feeling even more tired and cranky then when you first laid down. Have some other tips and suggestions on how to reduce stress? Share them below! Okay Jersey peeps, this one is for you because today I’m featuring Slater’s Deli in Leonardo, NJ! More specifically, I’m talking about the award-winning pork roll, egg and cheese sandwich that I tried there (thanks for the tip Jaime Marotta!). Before I continue, I suppose I need to explain what pork roll is to people outside of The Garden State. Okay so pork roll is….um pork roll is…uhhh hmm, how in the hell do you describe this? Lol okay some people call it Taylor Ham and it’s kind of like ham but it’s not…and it’s kind of like Canadian Bacon but it’s not. Lol hmm, someone feel free to help me out in the comments below! But yeah, it’s a processed meat kind of like the 2 that I just mentioned but it’s thicker and spicier (thick and spicy, ha reminds me of my ex girlfriend…). It is made of pork though (duh) so that might not fit everyone’s diet. But for those who can have it, you need to get to Slater’s ASAP! I ordered the gut-busting award winning Pork roll, Egg and Cheese (PE&C) with ketchup, salt and pepper and well…look at the pictures! Do you have a place or food item that I should check out? Let me know! Have other songs that fit today’s theme’s? Drop them in the comments below! Let’s double it up today! Results will be posted on our social media pages so make sure to follow! Okay, that about does it for today but I’ll be back again on Monday. In the meantime, please continue to like, comment, share and all that good stuff so that we can keep the conversation going on here and on my social media pages. I appreciate all of the support in helping the page grow so please continue to invite more people to join the party. Trust me, we’re only getting started! Until next time my friends, may the fork be with you. I’m loving the new blog! And yes, aliens do exist – you are one, aren’t you? And leave Space Jam alone, it’s perfect AF as is. lol I’m glad you’re loving the blog Aly! Tell a friend lol I definitely want more votes and discussion down here so the more the merrier! AND sorry I can’t confirm or deny your alien accusation – didn’t you watch E.T.? Pingback: Wheel of Fortune and Chill? The Scalding Hot Cup of McNasty and The Hindu Goddess of Love… – #DoubleFML FatDarrellPalooza! Pingback: Phe-Nom-Nom-Nomenal! 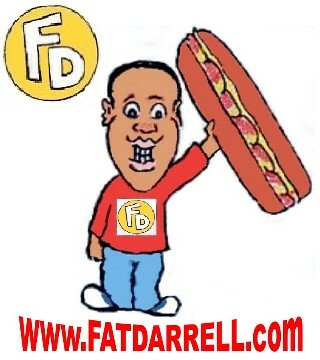 Counting Down the Top 10 Moments in Fat Darrell Sandwich History! – #DoubleFML FatDarrellPalooza! Pingback: I’m Going Back to Jersey… hmmm, I don’t think so. – #DoubleFML FatDarrellPalooza! Pingback: End it Part 1, The Cactus Part 2 and um There’s no Part 3 but Stopping at 2 Felt Kinda Strange… – #DoubleFML FatDarrellPalooza! Pingback: Under Pressure – #DoubleFML FatDarrellPalooza! Pingback: The Ugliest Shoes in the World, McNinjas and The Early Bird Gets the Canolli… Yeah Buddy, it’s the Cake Boss! – #DoubleFML FatDarrellPalooza! Pingback: Happy Birthday America! I’m a Xennial Ambivert ENTJ Scorpio and you? – #DoubleFML FatDarrellPalooza! Pingback: Total Eclipse of the Heart: I’m Not Your Biscuit – #DoubleFML FatDarrellPalooza!